NCC supports the commitment and expertise of certified nurses and has engaged in several public awareness campaigns to bring much deserved recognition to NCC Certified Nurses. 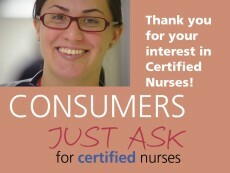 Just Ask for Certified nurses urges patients to Just Ask for certified nurses & nurse practitioners. It promotes the expertise, knowledge and commitment to quality care a certified nurse provides. 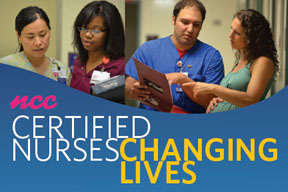 NCC Certified Nurses Changing Lives is an educational documentary demonstrating how certified nurses use their achievement of certification to positively affect patient care.